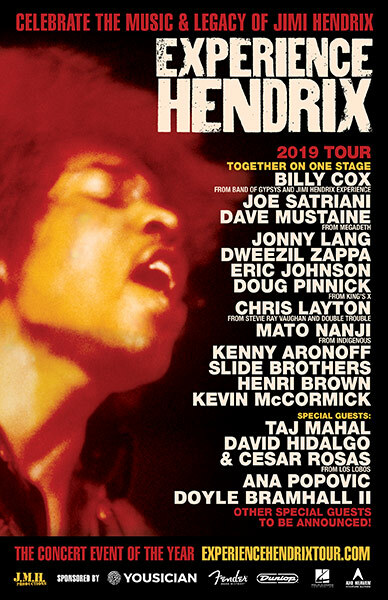 It has just been announced that multi-faceted guitarist/singer/songwriter/producer Doyle Bramhall II will be joining the 2019 Experience Hendrix Tour for select dates throughout March in the South and Midwest, including the tour kickoff at Pompano Beach Amphitheater in Florida March 3. A veteran of the Experience Hendrix Tour, the critically acclaimed multi-artist celebration of Jimi Hendrix's musical genius, Bramhall II will be joining artists as diverse as Joe Satriani, metal legend Dave Mustaine, blues great Taj Mahal, Dweezil Zappa, Jonny Lang, Eric Johnson and original Hendrix bassist Billy Cox. The Texas-bred son of a blues drummer, Doyle Bramhall II started his music career as a teen when Jimmie Vaughan recruited him to play with the Fabulous Thunderbirds. Two years later, Bramhall co-founded the Arc Angels with Charlie Sexton and Stevie Ray Vaughan's rhythm section of Tommy Shannon and Chris Layton, the later of whom is part of the Experience Hendrix Tour this year. Soon thereafter he launched his solo career, releasing four albums featuring his distinctive guitar work—he is a lefty who plays a right handed strung guitar flipped upside down. Brahmhall's most recent album, 2018's Shades, features guest appearances by Norah Jones, Tedeschi Trucks Band and longtime collaborator Eric Clapton. Bramhall II has been in demand as composer, guitarist and producer, collaborating with such as artists as Sheryl Crow, Elton John, Questlove, Gary Clark Jr., Erykah Badu, Gregg Allman, Robert Randolph, T-Bone Burnett, Meshell Ndegeocello, Dr. John and many others. "I'm very happy to be coming back to the Experience Hendrix Tour and to be a part of an experience that honors the greatest rock artist in music history and my personal biggest influence as a guitar player, songwriter and innovator," commented Doyle Bramhall II. "Jimi was one of the most inspired channelers and visionaries in music. It doesn't get any better than getting to share the stage and make music with Taj Mahal and [Cesar Rosas and David Hidalgo of] Los Lobos, let alone the great Billy Cox. A revue of Gypsys."